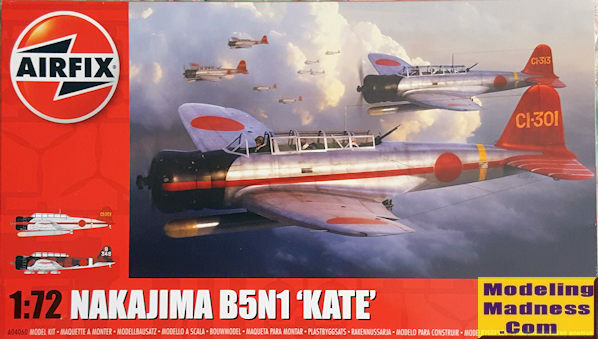 The Nakajima B5N (Japanese: 中島 B5N, Allied reporting name "Kate") was the standard carrier torpedo bomber of the Imperial Japanese Navy (IJN) for much of World War II. Although the B5N was substantially faster and more capable than its Allied counterparts, the TBD Devastator, Fairey Swordfish and Fairey Albacore, it was nearing obsolescence by 1941. Nevertheless, the B5N operated throughout the whole war, due to the delayed development of its successor, the B6N. In the early part of the Pacific War, flown by well-trained IJN aircrews and as part of well-coordinated attacks, the B5N achieved particular successes at the battles of Pearl Harbor, Coral Sea, Midway, and Santa Cruz Islands. Primarily a carrier-based aircraft, it was also occasionally used as a land-based bomber. The B5N carried a crew of three: pilot, navigator/bombardier/observer, and radio operator/gunner. No fully intact Kates have survived. There are pieces of one in Honolulu that may well be restored to display condition. This is one of Airfix's new toolings that I've been awaiting. This particular variant has not been kitted by any mainstream kit maker in this scale so it is nice to have it available. This plane was pretty much out of service by the time of Pearl Harbor, but it did operated quite a bit over China. As you might expect, this kit is mostly the same as the previously previewed B5N2. The main difference is the engine and cowling, which comes on a separate sprue. The kit offers a lot of options, probably the main reason it is a series 4 kit. You can choose between straight and folded wings, several different armament loads including a torpedo or several bomb sizes, the rear gun stowed or in the firing position, flaps up or down, canopies open or closed, a prop with or without a spinner and of course, the ability to model the plane in flight. This latter option requires you to purchase a stand set from Airfix or design your own. If doing the folded wings, you'll have to cut the upper and lower wings. You will be provided with wing detail inserts to cover the openings. The actual wing fold attachment points look quite fragile and Airfix has the outer wings attached at the end of the build. Jury struts are provided that will definitely help the sturdiness of this feature. As you can imagine, you need to plan from the start how your finished model will look in order to open all the various holes for these items and the weapons load. The interior is nicely detailed and there is sidewall detail. No belts are molded on the seats, but you do have three crew figures you can insert. There are decals to put over the raised detail on the main instrument panels. Separate rudder, ailerons, and elevators are also a nice touch. Airfix also supplies optional clear bits for the open or closed canopy option, as well as a closed option that has the rear gunner's transparency closed. Instructions are quite nicely done with 49 construction steps and the usual Humbrol color callouts during the build. Even the size of the holes to be drilled are provided (metric, of course). Two color options are provided. One is the box art plane in overall unpainted metal with a red tail section. This is your torpedo option and from the Zuiho in 1941. The other is in green and brown uppers with a light grey underside from the 14th Kokutai based in China in 1938-39 (your bomb option). 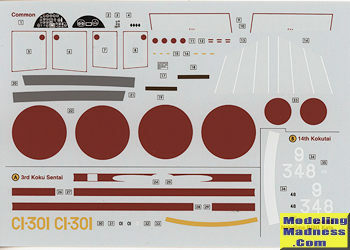 The decal sheet is nicely printed and includes stencils. I have darkened it to show the white bits better. I am probably the last person on the planet to get this kit, but since I did buy it, I figured I should review it. I cannot vouch for its total fidelity, but I have found that modern Airfix kits usually get all the major things right. The Kate is not a small plane and having all these build options makes it a kit that will find favor with those interested in the type. Late note: I have found out that the early Kate was released by Mania in the early 1970s and reissued as such by Hasegawa in the 1990s. This one is still, in my opinion, a better kit.